This article tries to answer some usual questions to those who first confront the challenge of making a synthesizer, and by extension, any other sound device. This is not a technical text by far, just some tips from the four year life of our DIY modular synth platform. We hope this can help people that plan to build a modular synthetiser. The feeling of making music with a machine built by oneself is something hard to describe. Each button is where you wanted it and the way you wanted , so communication user/ machine (and hence user/ music) is pretty straightforward. You also have the simple desire of learning things. We can´t forget that the electronic musician depends on electronics, and understanding should be considered a part of the unavoidable technical path to music. The tiny electrons are the raw material to shape your ideas, and electronics will help you understand them better. Thanks to the proliferation of the DIY community, it’s easier than ever to get a synth with the best specifications for a fraction of their ancestor´s price . The answer is yes…as long as you do not rush and work carefully. Enjoy the process and be patient, as this is the difference between a rewarding experience and a nightmare. Electronics is an extensive science, but you don´t need to know everything or be an engineer to build a synth. To start you just need to learn to solder, to distinguish the components using a multimeter and some mechanical skills such as drilling, accurately measuring or cutting wood. Afterwards doubts will arise, answers will come and you will expand your knowledge gradually. Contrary to what may seem, it´s not needed complex math knowledge to build a synth . Having some theoretical basis helps, although it’s not essential. Note that it´s not the same building than designing an instrument. The first is a mechanical process rather than an intellectual exercise. The second is a much more complicated issue that requires a lot of both worlds… and years of work . Of course , do not let that intimidate you. It is best to start small and understand things well. The key is to properly and slowly assimilate things so you don´t get overwhelmed… Just one step after the other! First, before building a synth, it should be clear what a synth is and what are it´s main components (at least roughly), then read some introduction to electronics manuals and soldering basics. On a couple of days you should be able to distinguish resistances and other basic components. Today there are plenty of websites where to find that information and where to get sound circuits of all types and difficulties. At first it is best to look for something simple that you can buy in kit format, or at least with a good PCB. This will take you straight to the point without the hassles of finding components or print your own circuit. Another factor to consider is the support available both by the authors as well as the users community. Try reading what is said out there about this particular circuit to get an idea. Choose your first project for its simplicity, good documentation and, of course, sound. Before getting into a full modular synth, get some simple synth noiser or a simple effect pedal with a few components to practice your soldering skills. Let yourself be confident with the matter, and then get into more complicated matters when you feel confortable. If you are strating from scratch is a good idea to get in contact with people with similar interests. So you can share your experiences whether in person or online. This is a lot easier and you can even share tools and expenses! You know that with friends… everything is better!! A decent fine tip soldering iron. Tin. The best, athough forbidden in the industry, is the “40/60”. This, having the melting point lower than unleaded tins, is best suited for home projects. Sponge and distilled water to clean the soldering tip. Cutters: small, slightly angled and sharp on one side. Digital multimeter. As a reference for starters, do not spend more than 15 or 20 euros. A small tray to avoid the components scatter the table. Where do I buy components? The electronics stores are hostile places for newcomers. For some strange reason , whoever is attending you have little or no patience (do not ask me why, but this is so) , so bring a very clear list of components and avoid rush hours. At least this is applicable to mayority of shops tried here in Spain. In local electronics stores (even in large cities) they have little stock. Unfortunately, little people buy components these days, and together with the massive migration of manufacturing to China and online shops, selling components is not a good business Therefore, unless you want make something very simple, you´ll have to use internet . There are many online shops where you can buy components , many with free shipping on purchases of a certain size . Also, for more rare and old stuff eBay is your best ally. For PCBs , it´s better to get them manufatured to begin with. If you decide to build them yourself, on our site we posted this tutorial. Ok, You’ve got all the components. First , take some time to prepare your working area, get proper lighting, and remove from your soldering iron range any elements you could burn . Print documentation , PCB layout, parts list or BOM (bill of materials ) and assembly manual and leave them at hand. Use a pen or highlighter to check off the BOM components you place. Adviceable to be tidy in order to be sure everything gets soldered in it´s right place. .
Keep your components in a tray, so that you will not drop anything. Always double check that all components are the right ones and their correct position before placing them. Better to lose a minute here than ages looking for a bug . In electronics, running is the best way to make mistakes , and in many cases never end . If you have any doubts go to the next component , and you’ll see that as you go discarding remaining parts will get clearer . Solder first low profile components. 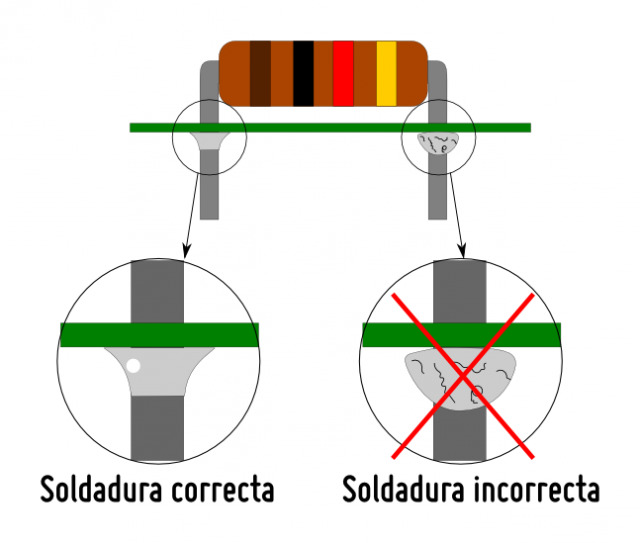 In this way, the large components such as connectors, or potentiometers do not clog during assembly of the smallest ones. Never leave fixing of shoddy work for later! Each solder has to be perfect. If not, remove the tin with a desoldering pump. Try until you get it, do not get next one until it´s ok . If after two or three solders you see that you are doing it wrong, Stop and practice with something cheaper or simpler. Keeping working on a clumpsy way is a waste of time and money as what you’re bulding will fast become trash, or worse, will stop working in the middle of a gig! A very effective trick to get good welds is not moving the soldering iron when soldering. Place the tip at the intersection between the leg of the component and the pad , and do not move it until you finish soldering. With the other hand measure the amount of tin. Note that when the whole leg-Pad-tin has sufficient temperature , it will automatically stick, no need to place tin with the soldering iron as painting the Pad. When you plug your machine for the first time ,first check if any component is rapidly heated . If you do, unplug immediately , as this can damage these components. Do all components have the correct values? Are polarized components mounted on the right direction? This is important especially in LEDs, electrolytic capacitors, connectors, diodes and integrated circuits. Is there a short-circuit? If the device does not start and the power supply or battery heats up, you probably have a short circuit. Unplug it and check for continuity with a voltimeter between the positive and ground and between the negative and ground. This happens usually because some soldering is joining two legs that should not go together. Is power supply properlly plugged? Are all wires soldered and go to the right spot without touching each other ?